Another tweaking for 1.1: A completely reworked loot function! It scales quite fast: There is a point in the game where you suddenly get flooded with lots of loot. It has a hard cap at 400% item chance. Additional item chance boosters have no effect. 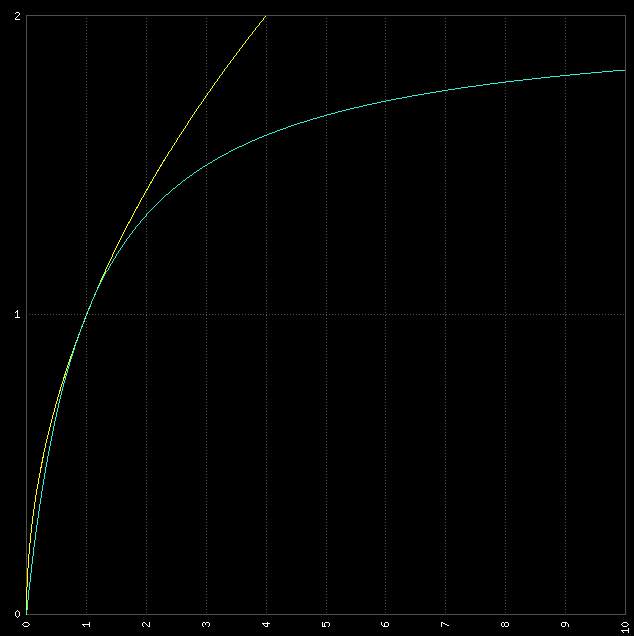 Have a look at the current function (yellow graph). It grows very quickly from 100% (initial item chance) to 400% and caps from there on. Now, the new function (blue graph) is quite different. It grows moderate from 100%, but keeps growing indefinitely. Every item chance boost has an impact, however the higher the chance already is, the less impact of new boosts. This entry was posted in Game Mechanics on July 26, 2015 by Andy. So item chace is nerfed right? Hi MeekoLyn, sorry to hear that. I’m checking the wordpress installation right now. thanks for reporting the issue, I investigated it and it turned out that there was indeed a misconfiguration of the e-mail smtp server on my wordpress installation. Thanks to your help I was able to resolve the error! You should be able to sign up to the forums now. Indeed! Final bugfixing / polishing / balancing phase is almost done! You dont know it andy but my excitement for the new content (especially the wolf buff) is overflowing, I am ready. We are getting a new leader board for 1.1 correct? I just found out that the new drop function is a lot larger nerf than everybody(probably including Andy?) thought. I just checked out what mathematical function Andy actually used. And guess what? It DOES NOTgrow indefinitely high, it just grows indefinitely towards 2. That means that with every water of life your drop chance increases, but it will never reach 200%, while getting higher than 200% is impossible. Since last drop function had cap at 400% and the new one is supposed to grow indefinitely while actually being soft capped at 200%, I guess this is not intentional. A useful range for the internal chance has been [0,2]. Previously you needed 400% item chance to reach internal max value. This happened very quickly and further item chance increase had no effect. With the new function you never reach internal max value. But every item chance increase brings you a bit closer to that max value. Oh, thnaks for the explanation. I thought it was a mistake since no cap was mentioned.